The human impulse to religion—the drive to explain the world, humans, and humans’ place in the universe—can be seen to encompass environmentalism as an offshoot of the secular, material faith in human reason and power that dominates modern society. 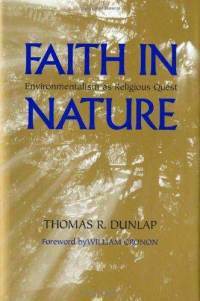 Faith in Nature traces the history of environmentalism—and its moral thrust—from its roots in the Enlightenment and Romanticism through the Progressive Era to the present. Drawing astonishing parallels between religion and environmentalism, the book examines the passion of the movement’s adherents and enemies alike, its concern with the moral conduct of daily life, and its attempt to answer fundamental questions about the underlying order of the world and of humanity’s place within it. — University of Washington Press website.